Throughout the history of the United States – a nation born out of distrust of a seemingly detached legislature – it has been common (not to mention great fun) to ridicule our elected representatives. The time-honored tradition of characterizing office-holders, from the president on down, as crooks and bunglers is perhaps the most widely-practiced pastime of Americans. Nothing will get a conversation going faster than, “How about that Congress?” And it will be a conversation devoid of anything but outraged complaints. It does not take long for that conversation to light upon how members of Congress are grossly over-compensated for their perceived uselessness. It is accepted knowledge that the enormous salary of a representative or senator is a scandal, but decrying the limitless fringe benefits of the job has become an industry of its own. The “golden Cadillac” health care program they get for free. The full-salary retirement pay for life, immediately upon leaving Congress, after as little as one day in office. The exemption from Social Security and Medicare. Voting themselves raises. Exempting themselves from the laws they enact, such as Obamacare. A proposal for a Twenty-Eighth Amendment to the Constitution that would correct this disgraceful state of affairs regularly makes the rounds on social media. Yes, it’s a sorry situation. Or it would be, if it were true. Those well-known benefits of being in Congress are in most cases just plain false. Let us examine some of the more popular legends. Myth: Members of Congress do not pay into Social Security or Medicare. Yes they do. They – along with the president, federal judges, and Cabinet members – have been paying into Social Security and Medicare since 1984, and at the same rate as privately-employed Americans. If they receive both a government pension and a Social Security benefit, their pension is reduced by the amount of that Social Security benefit. Myth: Members of Congress do not pay into a pension plan, but are given a pension for life equal to their full salary as soon as they leave office, even if they were in office only one day. This is a wild one. I don’t know where it came from. Members of Congress are covered by Federal Employees Retirement System, the same retirement program that covers all civilian Federal employees, including secretaries, janitors, and park rangers. Because the system has undergone changes over the years, the fees and benefits vary according to when the participant entered Federal service. You can read the complexities here. The amount paid in varies, but members now entering service pay 10.6 percent of their gross pay into retirement programs. Members of Congress must have at least five years of service to receive any pension at all. Benefit payments begin at age 62, at age 50 with 20 years of service, or at any age with 25 years of service. Benefits are proportional to salary and service time. Nor can a member receive a full-salary pension. The maximum is 80 percent of salary, regardless of age or years of service. The current average pension received by retired Congress members is about $60,000 per year – around one-third of the current annual salary. Congress members may also participate in the Federal employees’ Thrift Savings Program, which is the government employees’ equivalent of a private sector 401(k) plan. Myth: Members of Congress vote themselves raises. 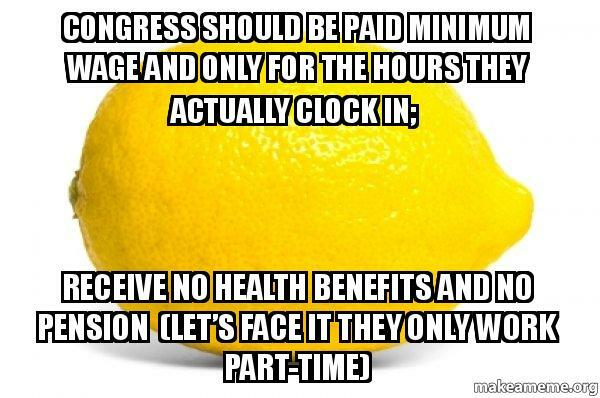 Congress cannot enact a law to give itself a raise. Members of Congress now receive the same cost-of-living increase that other Federal employees get. It is determined by an independent agency, and Congress votes to decline or accept the raise. Since 2009, Congress has turned down proposed raises. In addition, even if the proposed raise were accepted, the Twenty-Seventh Amendment to the Constitution provides that such as raise cannot take effect until after the next election of House members. All of the House members and a third of the Senate must successfully run for re-election before they could get a raise. Myth: Members of Congress have exempted themselves from the Affordable Care Act (Obamacare). Not only are members of Congress covered by the ACA, they also have an additional requirement that is not made of ordinary citizens. The provisions of the ACA required that Senators and Representatives give up the health insurance they already had through the Federal Employees Health Benefits Program (the same insurance that covers all other Federal civil service employees). They now must buy policies through the exchanges Obamacare set up for individuals who cannot obtain employer-sponsored coverage. Myth: Members of Congress are not subject to the same laws that apply to other citizens. The Congressional Accountability Act stipulates that members of Congress must be subject to the same laws as everyone else. There are a few exceptions related to the “separation of powers” doctrine, including the specific exemptions in Article I, Section 6 of the Constitution. Myth: Members of Congress get a “gold-plated” health care program for free. This is the only part of the “Congressional benefits” complaint that is not just plain wrong. As noted above, Senators and Representatives are required to purchase health insurance through Obamacare. However, they also have some medical care provided by the on-site Office of the Attending Physician of Congress, through which they and their staff receive routine physical examinations, certain diagnostics, and emergency care (which is also provided to visitors to the Capitol) for a fee about 50 dollars a month. The extra benefit to this is that, sometimes, specialists are brought in at no additional charge. The funding of this office that is not covered by members’ payments is charged to the Department of the Navy. In the end, what can we conclude from this? That the American public does not like their legislators and wants to punish them? The surest way to do that would be to vote them out of office. Every two years, however, we see that the public does not want to defeat incumbents; they keep re-electing the people they claim to despise. There is something about public service that makes a lot of Americans angry. The idea seems to be that since “I pay their salaries,” public servants must not only be fully and immediately responsive to me and my wishes, but also must do it for next to nothing. As if, somehow, being paid low wages will make one a better employee. An oft-repeated maxim in American life is, “You get what you pay for.” Yet we expect the President of the United States to run the biggest operation in the world for compensation that is about one-tenth of what the CEO of a moderate-sized corporation gets. We expect members of the House and Senate, who create the laws we all must live under, to do it for $174,000 a year (a bit more for leadership positions). No self-respecting member of the corporate executive class would work for that. I wonder if better pay and benefits would attract better people to elected office. Somehow I think that plan will be left untried. Previous Previous post: HOW TO REPEAL-AND-REPLACE OBAMACARE?